A queen and worker Argentine ant, Linepithema humile, pose for a photograph near Córdoba, Argentina. Linepithema flavescens, a small yellow ant from Haiti, is one of the species I re-described as part of my Ph.D. dissertation. All we know about this ant, apart from the brief notes on the specimen labels, is the external appearance of a few workers. Queens and males haven’t been collected. No one has studied its ecology or behavior. The few existing museum specimens- gathered from two different field sites- may be too valuable to attempt DNA extraction. A 1934 collection is the last time anyone has ever seen L. flavescens. As the natural ecosystems of Haiti have been entirely destroyed in the intervening years, it is possible the species is extinct. Or not. It may persist in little pockets, or in the neighboring Dominican Republic. As far as I know, no one has ever looked. There are, quite literally, tens of thousands of invertebrate species in the same predicament. Known only from the initial taxonomic notes, and collected from forests long since felled, the remaining specimens are like fossils. There are too few scientists, no resources, and too many species like these for anyone to do so much as even send someone out for a weekend to search for them. So it is that scores of species drop out of existence, unnoticed. The Argentine Ant (Linepithema humile), a small brown ant about 2-3mm long, is one of the world’s most damaging insects. This pernicious ant is spreading to warmer regions around the world from its natal habitat along South America’s Paraná River. Linepithema humile can drive native arthropods to extinction, instigating changes that ripple through ecosystems. In California, horned lizard populations plummet. In South Africa, plant reproduction is disrupted. Worldwide, the Argentine ant is a persistent house and crop pest. This is not a good ant. My Ph.D. dissertation, completed a few years ago, dealt with the taxonomy and evolution of the 20 or so mostly obscure species in Linepithema, the broader group from which the Argentine ant emerged. The project had many different aspects, but most people will only care about one small part: I figured out how to reliably identify the Argentine Ant. The taxonomy of the Argentine Ant has been a particularly difficult problem in South America where several frustratingly similar species co-occur. Researchers who try to study L. humile in its native habitat occasionally end up working with the wrong species. That’s an embarrassing error, and one that has resulted in misinformation about the Argentine Ant spreading through the literature. I won’t bore you with the details of the thousands of Linepithema specimens I looked at to determine exactly what was and wasn’t an Argentine ant. But I will share the result, a system for separating Argentine ants from related species. 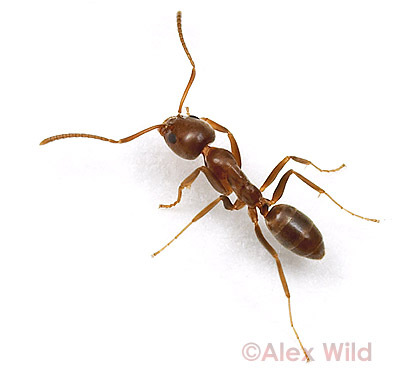 Here is how to tell if you’ve got an Argentine Ant.